Expedia (NYSE: EXPE) reported its fourth-quarter earnings on Feb 8, 2018. Results posted were not in-line as the company planned and instead reported EPS of $0.84 for 2017 Q4 missed the estimates of $1.15 which caused the share price to drop by almost 15%. However, the company seems to have progressed in several other areas. For example, last quarter was spent aligning with the new strategy and bringing it to the execution mode. Expedia seems to have missed the expectations but overall growth was seen in global brands (Brand Expedia, Hotels.com, Egencia, and Expedia Affiliate Network). 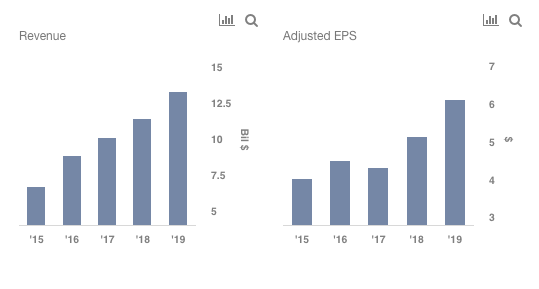 For FY18, We expect the Adjusted EPS to be $5.12. Take a look at our interactive model to see Expedia’s performance. You can even modify inputs in blue dots on the model if you have a different view. Revenue for the Q4 grew to $2.32B up by 11% approximately for the same period last year, but still missed estimates by $40 Mil. The increase was mainly due to the increase in Gross Booking to $19.8 Billion in 2017 up by $2.4 Billion or 14% y/y from 2016, which is attributable to growth in Brand Expedia, HomeAway, Hotels.com, EAN, and Egencia. HomeAway advanced on its transition to an e-commerce business where Gross bookings increased 46% y/y to $8.7 billion on its platform in 2017. In 2017 Q4, Room nights stayed increased 17% y/y for Brand Expedia, Hotels.com, Expedia Affiliate Network, and Egencia combined with a 30% y/y increase for HomeAway. As of Dec. 2017, properties available on Core OTA lodging portfolio increased to more than 590,000 up by 69% y/y which includes more than 150,000 listings for HomeAway. In 2017, Egencia signings from new client business totaled to $1.4 Billion where 2017 Q4 was the record high registering $405 Million of new business approximately. Revenue from Trivago grew by 18% on a standalone basis but half of it was primarily driven by foreign exchange. Although, we expect that it will continue to grow in the longer run. Speed up the execution of the strategy of becoming relevant on a global basis to accelerate growth. Focus on adding nearly 2 times the properties to the core OTA platform as compared to 2017. To become more customer-centric, i.e. to put A back into OTA is company’s another agenda this year, to make the customer experience easier. To add more products and features for a new shopping experience on Brand Expedia which is currently in the testing phase.